I am the webmaster Juliette Benzoni’s official Catherine de Montsalvy website. While I searched about facts about the English Catherine books, I saw your image of the two Ladies which were used for the same book ! The one on the left : ONE LOVE IS ENOUGH by Juliette Benzoni – the one on the right : The Lady of Monkton by Elisabeth Byrd. I think I can answer your question exactly. ONE LOVE IS ENOUGH was first 😉 http://www.catherinedemontsalvy.ch/English/Books/Covers/Canada_book_covers.htm here you come directly to my extra page about the Catherine covers. One love is enough was first published by HEINEMANN in 1964 – when the Pan book was published I can only guess, because I once had the silly idea to give the paperbacks away after I bought the hardcovers for a lot of money ! It must have been around 1968 or before, because that was the year I bought the first books. Mister Tyssen from Canada told me the three Catherine books were especially made for the Canadian market ! Which is also a curiosity, since all in all there were six Catherine books and Pan published them all. (The seventh book they never translated so far ! My re-search now gave this result: first was One Love is enough and The Lady of Monkton was first published in 1975 as hardcover. If it is correct what I find on the Net, it was later in 1981 published by Pan. But I would say it was before. Hope I was able to amuse you a bit with my story. 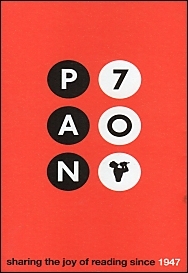 I read loads of Pan books in the sixties and seventies. Can you help with a question about publishing dates? I have a PAN book of Agatha Christie’s ‘Hercule Poirots Christmas’ and the page with the dates for first published, later editions etc, has been torn out. The cost on the back cover was 3/6d. Any ideas?